Arthur James Wetherall Burgess (1879-1957). Oil on board; signed. 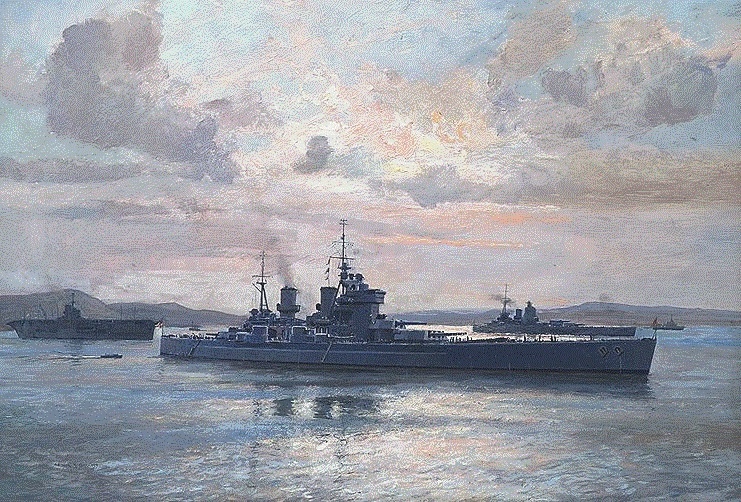 The 14 inch battleship HMS PRINCE of WALES (Captain J C Leach MVO RN) is painted here at anchor with HMS ARK ROYAL and HMS RODNEY: they appear to be lying in the great northern anchorage of Scapa Flow and the year must be 1941 for PRINCE of WALES was only completed early in that year and she and ARK ROYAL had both been sunk by the year's end. Arthur James Weatherall Burgess (1879-1957) was born in New South Wales, Australia and studied art in Syney. By 1901 he had moved to England and had set up his studio in St Ives in Cornwall. By 1904 he had become a regular exhibitor at the Royal Academy and at the Royal Institute of Oil Painters, the Royal Institute of Painters in Watercolours; and at the Paris Salon. He was also a regular contributor to the Graphic, Illustrated London News and Sphere magazines and during World War 1 he sent paintings back to Australia to support the war effort there. The National Maritime Museum Greenwich has 4 of his paintings and the National Museum of the Royal Navy in Portsmouth and the Library of New South Wales in Australia are amongst many other institutions around the world who similarly hold and exhibit him. He is widely admired for his skilful portrayal of light on water, and his delicate skies rarely disappoint.